There are various ways to encrypt your files and folders, and one of the ways we have shown here is using EncFS. 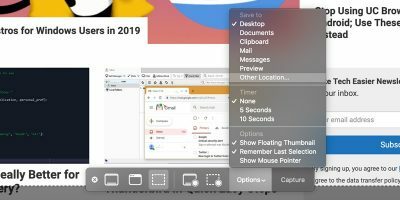 In fact, it is one of my favorite tools, as it is cross-platform compatible and is not dependent on any third-party apps. 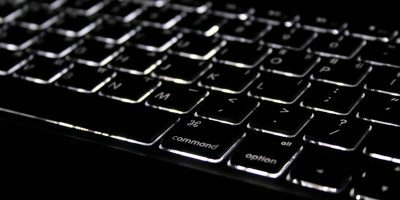 The only troublesome thing about EncFS is that it is command line-based and requires the use of terminal (or command prompt) to manually mount the encrypted folder. 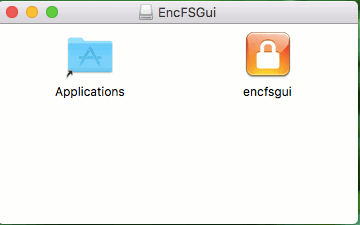 EncFSGui is a simple wrapper tool for Mac OS X that allows you to easily create or automate the mounting of an encrypted folder via a GUI window. It makes the whole mounting/unmounting process simple and effortless. Note: for Linux you can check out Gnome Encfs Manager. EncFSGUI is a wrapper for EncFS, so it is obvious that you need to install EncFS for it to work. 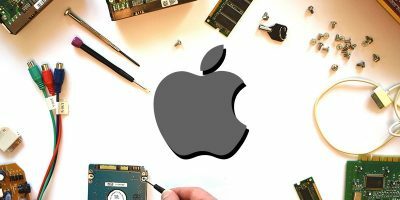 If you haven’t installed EncFS in your Mac, you can head over to the guide here for installation instructions. To install EncFSGui, all you have to do is download the .dmg file from its GitHub page. Launch EncFSGui from the LaunchPad. On the first run, you will probably encounter the following error. To fix this, open “System Preferences” and go to the “Security and Privacy” section. 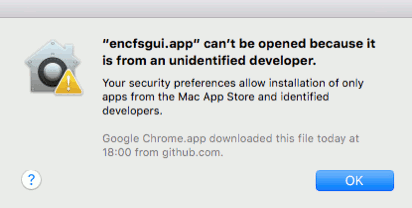 In the General pane, click “Open Anyway” to grant permission for EncFSGui to run. Once the app is launched, you will see a window like this. To get started, you can click the “Create” button to create a new encrypted folder. 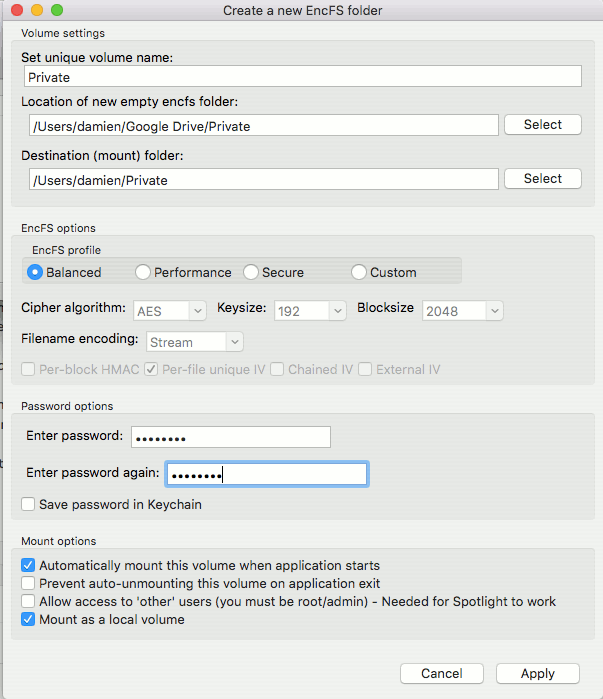 Unique Volume name – this is the identifier for the encrypted folder. Location of new empty encfs folder – this is the folder to be encrypted. There shouldn’t be any files in this folder. 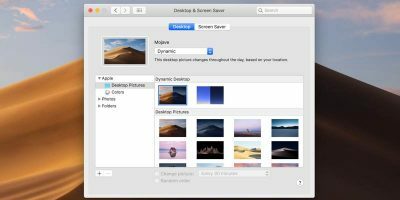 Destination (mount) folder – this is the decrypted folder. All files placed in this folder will be encrypted (and will show up in the above encrypted folder). Password – make sure it is a strong one. 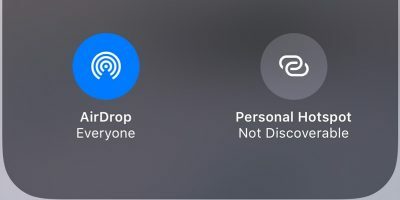 mount as a local volume (so it will show up in the Finder sidebar). Once you are done setting the configuration, simple click Apply to create a new encrypted folder. 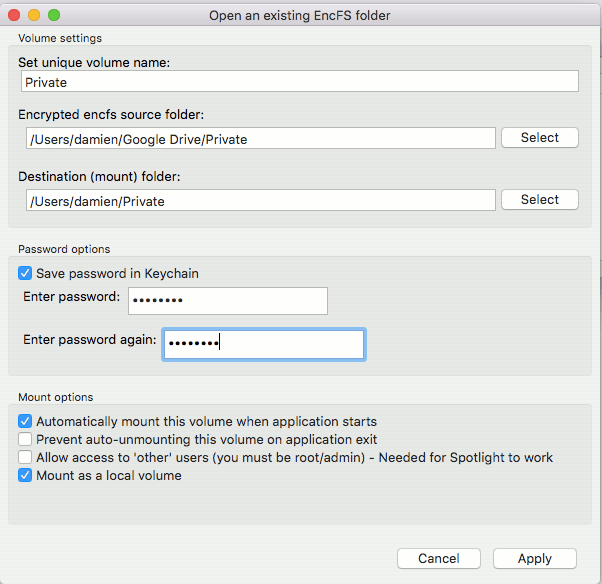 If you already have an EncFS encrypted folder, you can click the “Open Existing” button to mount the encrypted folder. The configuration is similar to the above “Create” option. Lastly, you can click the “Settings” button to access the Settings. The only thing you need to configure here are the “startup and exit options.” You can set it to run automatically at login and if it starts as an icon in the taskbar. 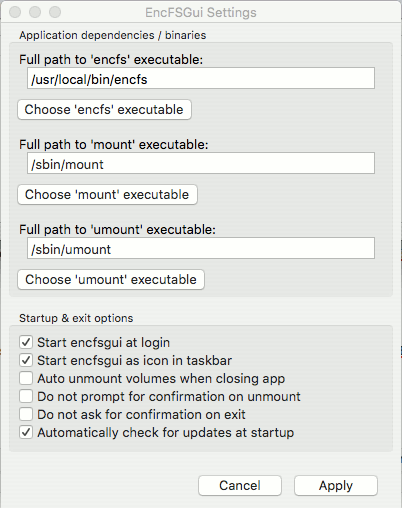 Note that if you have enabled the “Automount when application starts” option above, and you set EncFSGui to run at login, your volume will be automatically mounted once you are logged in to your Desktop. Once everything is set up properly, you will find the EncFSGui icon in the menubar. With a simple click, you can now easily Mount/Unmount an encrypted volume. 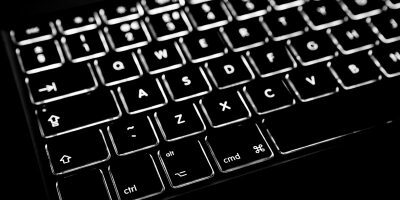 EncFS is useful for encrypting your files and folders, but many people find it complicated to use due to its command line nature. With a GUI tool like EncFSGui, you can now easily create or mount/unmount an encrypted folder to store your confidential files. 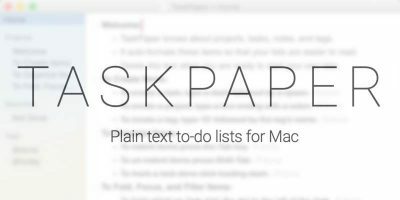 This is particularly useful when used together with cloud storage like Dropbox or Google Drive. It will ensure that all the files you stored in the cloud are encrypted and not accessible to others. Do you think such a GUI tool is useful? Let us know in the comments. 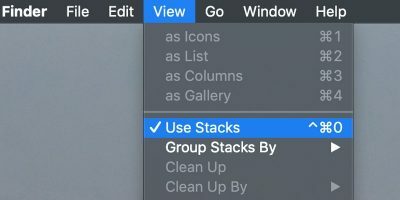 works with macos sierra like a charm – thank you for your guide (was using getsafe, but no 10.12 support there)!